Escape to a rural idyll on a working olive and citrus farm in the toe of Italy. Attentive hosts, good for kids and great food! If you have any questions or want to enquire about dates, use our form to contact Clelia Iemma or see their website for more information. On a gently sloping hillside gazing out to the Mediterranean, enjoy the peace of the family home of Clelia and her parents Rocco and Marisa. Surrounded by olive trees and a heady mix of tropical plants – bergamot, oranges, avocado, macadamia and guava – wander the lush grounds, relax by the pool and feel the stresses slip away. The four simple but homey apartments, each with full kitchen, are in the main house (which is shared with the family) but have their own entrance. The four double rooms, with floral bedspreads, tiled bathrooms and terrace, are on the hillside just below the pool. Tuck in to breakfasts of fresh bread, jams and fruit from the farm in the rustic loggia dining room while enjoying sea views through the palm trees. Kids will love the pool, play area and table football. Go horse riding or hike the nearby mountain reserve, visit archaeological sites and medieval villages, or head into town, just three miles away. For the energetic, join in with the farm work or head for the kite surfing centre nearby! Return to dinners of mouthwatering Calabrian dishes served at the family dining table. Minimum stay: 3 nights. Pets by arrangement. Dinner available on request. Restaurants 5km. Singles €40 - €65. Dinner, B&B €55 - €65 per person. Extra bed/sofabed available €0 - €10 per person per night. With views stretching from our house, you can enjoy the acrobatics of kite surfers on Gizzeria’s beaches, one of the most well-known spots where you can learn to “fly”! The Caronte thermal baths are only a 5-minute drive away. Renowned for having two different types of refreshing water, the spa is perfect for your health and well-being! You can “cross” Italy in only 20 minutes! 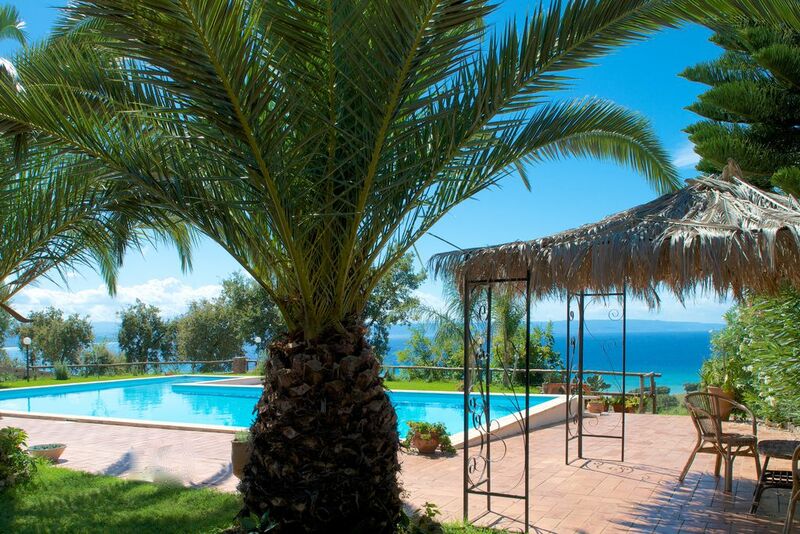 Being at the thinnest point of Calabria and Italy, a stay at Agriturismo Livadia allows you to to travel between the Tyrrhenian and the Ionian Sea taking in the diversity of both countryside and nature. You’re in the heart of one of the most unexplored regions of Italy. In one hour in any direction you can bear witness to the wonders of the landscape: untouched paradisiacal beaches, archaeological parks, mountains, and a huge variety of culture. In the surroundings are thrilling cycling routes, walking and hiking trails, the Mediterranean flavour of olive groves, Oak trees the scent of Gorse and the stunning backdrop of the sea framed by the Aeolian Islands. The charming city of Pizzo is only a 20-minute drive away. There, as well as taking in breathtaking views of the sea, the Castle of Mur and the Church of Piedrigotta, you can treat yourself to truffles and delicious ice creams.